Surely you know of these people. Marilyn Monroe, that voluptuous young lass with juicy puckered lips, alluring half-closed eyes and flimsy white skirt fluttering dangerously high above her knees. Audrey Hepburn, the alluring actress who shocked-and enticed-the world by being the first woman in Tinseltown to wear the heck out of a pair of pants and flaunt it. Princess Diana, the altruistic maiden of Wales who made the color red synonymous to her name. What do these women all have in common? These women have all been immortalized by their unique sense of fashion and style! At one point or another, every woman must have looked up to one or all of these icons and wished to have blown the world away with the power to set fashion trends or influence the shifting of styles in the fashion world. But what is fashion? What is style? Exactly which is which? It is important to note that not every piece of clothing garment or accessory can be worn at all times, unless of course it has proven to be a classic; still, classic items have a tendency to change and evolve so as to adapt to current times. For example, denim elephant pants was a huge fashion hit several years back; but now, it is no longer considered trendy or fashionable. But pants have been a main staple, and its style changes from time to time. There are several styles, such as bell-bottoms, skinny jeans, and high-waists. It is also important to consider the setting, or place, where a certain fashionable item comes from, and whether its style prevails or not. Cultural and traditional differences exist all over the world, and these differences surely affect aspects of one's lifestyle, fashion and style included. Also, weather conditions differ from one place to another. For example, jackets are in during the colder months in Europe, US and Japan, where winter season lasts for several months. On the other hand, people in tropical Asian countries such as the Philippines, Malaysia and Indonesia do not need such garments during those months, because of dissimilar weather conditions. Also, what one can wear during summer cannot be worn during winter times, since one's comfort, safety and bodily protection are also factors to remember. What one can wear during summer cannot be worn during winter times, since one's comfort, safety and bodily protection are also factors to remember. One should not only crave for what is trendy. One should also put into consideration health and protection from harsh weather conditions. Basically, fashion is more universal. It refers to one's clothes and the relationship of these clothes' acceptability and adaptability to one's place, time, culture and tradition. 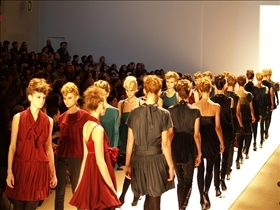 Fashion dictates what may or may not be considered as popular clothing in a given period of time and place. Style, on the other hand, is more individual and more personal. It refers to one's form of self-expression, uniqueness and freedom of choice. Fashion is dictated through trends, while style depends on a personal inclination towards trends. Lifestyle Now vs. 100 Years Ago: What has changed? Snuggie vs. Slanket: Which is better?